The ex-VP is constructing a narrative around torture that makes unflinching political use of the powers of secrecy. 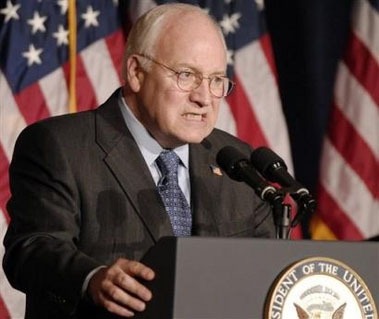 Torture, as the former vice-president’s words suggest, is a critical issue in the present of our politics—and not only because of ongoing investigations by Senate committees, or because of calls for an independent inquiry by congressional leaders, or for a “truth commission” by a leading Senate Democrat, or because of demands for a criminal investigation by the ACLU and other human rights organizations, and now undertaken in Spain, the United Kingdom, and Poland. For many in the United States, torture still stands as a marker of political commitment—of a willingness to “do anything to protect the American people,” a manly readiness to know when to abstain from “coddling terrorists” and do what needs to be done. Torture’s powerful symbolic role, like many ugly, shameful facts, is left unacknowledged and undiscussed. But that doesn’t make it any less real. On the contrary. Torture is at the heart of the deadly politics of national security. The former vice-president, as able and ruthless a politician as the country has yet produced, appears convinced of this. For if torture really was a necessary evil in what Mr. Cheney calls the “tough, mean, dirty, nasty business” of “keeping the country safe,” then it follows that its abolition at the hands of the Obama administration will put the country once more at risk. It was Barack Obama, after all, who on his first full day as president issued a series of historic executive orders that closed the “black site” secret prisons and halted the use of “enhanced interrogation techniques” that had been practiced there, and that provided that the offshore prison at Guantánamo would be closed within a year. In moving instantly to do these things Obama identified himself as the “anti-torture president” no less than George W. Bush had become the “torture president”—as the former vice-president, a deeply unpopular politician who has seized the role of a kind of dark spokesman for the national id, was quick to point out. It seems that his general style is to try to find consensus rather than to isolate people and confront them. I think that an early tip-off to his thinking was when he described possible accountability as “witch hunts” and said we’re not going to have witch hunts. And yet I think that they’re going to find it impossible to be where they are. Right now, they’re trying to assert some kind of neutral position about the Bush years. They’ve come out critical, they’ve said “we’re fixing this, it was wrong,” and they have started to fix it — I give them credit for doing a lot of the right things. But what they’re trying to do is not have to open up the past, as they keep saying, and I don’t think that’s going to work because they’re going to have a choice here. They’re at a fork in the road, where either they’re going to open things up, or they’re going to have to cover things up. There’s not a real neutral position to be there. And that’s what I think they’re beginning to realize. Mr. Cheney’s politics of torture looks, Janus-like, in two directions: back to the past, toward exculpation for what was done under the administration he served, and into the future, toward blame for what might come under the administration that followed. Put forward at a time when Republicans have lost power and popularity—and by the man who is perhaps the least popular figure in American public life—these propositions seem audacious, outrageous, even reckless; yet the political logic is insidious and, in the aftermath of a future attack, might well prove compelling. …Cheney’s politics of fear—and the vice-president is unique only in his willingness to enunciate the matter so aggressively—is drawn from the past but built for the future, a possibly post-apocalyptic future, when Americans, gazing at the ruins left by another attack on their country, will wonder what could have been done but wasn’t. It relies on a carefully constructed narrative of what was done during the last half-dozen years, of all the disasters that could have happened but did not, and why they did not, and it makes unflinching political use of the powers of secrecy. This entry was posted in Apocalypse and tagged torture on 11 Apr ’09 by admin.